Pyramid Quest for Immortality online video slot is a slot with a distinct 3-4-5-4-3 reel layout and not less than 720 ways to win. This game is among the top slot games created by NetEnt and it features superb graphics and it makes use of the Avalanche Reels feature where multipliers of up 10x can be earned with consecutive wins in a single spin of up to 36,000x your stake value. The background of Pyramid Quest for Immortality Slot is Anubis and Horus guarding the entrance of a pyramid, along with stars shining in the sky. Symbols associated to the game are hieroglyphics, golden snakes, golden eagles, bejewelled scarab beetles, the pharaoh, a princess, and the Golden Ankh. On top slot game Pyramid Quest for Immortality, you can stake from £0.01 to £2.00, plus you can further increase your stake value by selecting between level 1 and 10. Up to 1,000 games rounds can be opted to play automatically by pressing on the Auto Play button. Winnings are awarded for Ways to Win when 3 matching symbols land on adjacent reels commencing from the leftmost one. As opposed to other online slots, symbols on this game does not spin but tumble into position on the reels. When you get a bet way win, it starts an Avalanche, where the symbols in the winning combo disappear to allow other symbols to fall into the empty position. This can trigger consecutive wins in just a single spin and it continues until no more winning combos are possible. An Avalanche Multiplier is increased with every third consecutive Avalanche win in a single spin and it can reach up to 10x. Once the multiplier is 10x, it stays this way for any subsequent avalanches until no more ways to win is available. Symbols appearing on the top of reels 2, 3, and 4 which are part of a winning combination are transformed into Wild symbols for the Avalanche that follows. And this can greatly enhance the chance of creating a number of successive wins. 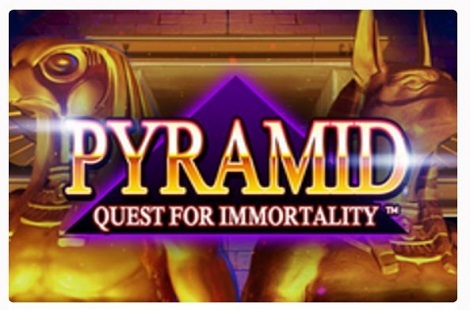 Join the great Egyptian Gods for a quest for the precious wins on Pyramid: Quest for Immortality Slots! You can find similar Egyptian themed slots on top gaming sites listed by Onlinebingoreviews.com.